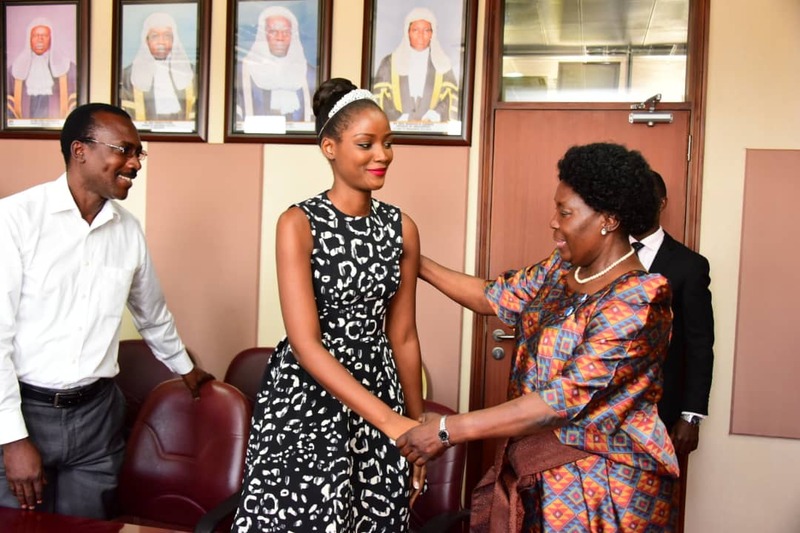 KAMPALA – The current Miss World Africa and Miss Uganda 2018/19 Quin Abenakyo was set to kick start her tour, dubbed #TulambuleNeQuin, across Eastern Uganda on Sunday. Yet, according to Brenda Nanyonjo, the C. E. O of Miss Uganda, she is incapacitated. By 8:00 pm, the meeting and set off point, the Independence Monument was heaving with people. Journalists, bloggers, tourism bigwigs, together with the different tourism stakeholders had gathered for a set-off. The flag off was supposed to be done by Quin Abenakyo, flanked by the state Minister for Tourism, Wildlife and Antiquities, Hon. Geoffrey Kiwanda. Yet, according to the #TulambuleNeQuin tour planner and head of production, JK Kazoora, information from Miss Uganda prompted the decision to postpone the trip. According to Brenda Nanyonjo, caretaker and C. E. O of Miss Uganda, Quin Abenakyo is in no shape to embark on a 4 days long road trip. “She is in hospital at the moment, undergoing treatment,” explained a frail Brenda Nanyonjo, who is reportedly also sick. “It is sad indeed. But it was a circumstance way out of our control. For Miss Uganda, Quin Abenakyo to fall sick, at the same time with Brenda Nanyonjo is certainly not the way we envisioned today happening. But their health is as important, ” relayed Kazoora, speaking to the press that had gathered at the Independence Monument, ready to board the tour bus. Claire Mugabi, the head of Marketing And Communications Uganda Tourism Board (UTB) expressed her apologies about the incidence. “I understand many people were bracing themselves for the trip. A reason we’d hoped that her health would get better. Unfortunately, because we understand the nature of activities on the trip, taking her in the current shape would be putting her health at risk, ” explained Mugabi, Head of communications UTB. Claire emphasized that the trip is not canceled, but rather postponed. And that the new date shall be dictated by Quin Abenakyo’s health. And that it will be communicated as and when she gets better.